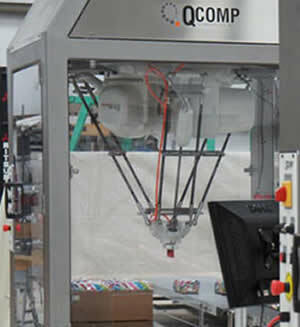 QComp Technologies advanced robotic picking system feature several types of Delta robots. These high speed "ceiling mount" robots are also commonly known as spider robots. These robots provide extremely fast movements utilizing three servo driven arms linked to a central "delta" plate. Four axes of motion are most common but three axes and six axes versions are available. The speed of these robots and the ability to incorporate vision systems with the robots provides the ideal mechanical device to pick and place items. 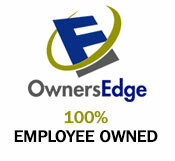 The most important part of your system is the integrator to bring the mechanical portion to life. 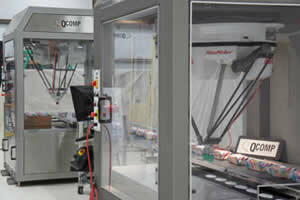 QComp has installed hundreds of Delta robot and vision systems. 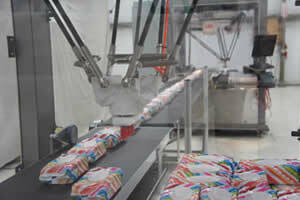 Our systems are designed to be robust and easy to use, providing the highest up time and best throughput. Published picking cycles are up to 180 per minute, but the actual throughput rate of a cell is dependent on the weight of the load, tooling type, and the products ability to handle the movement accelerations. Robots available in small desk top sizes from .5Kg loads and 280mm reach to larger sizes with 6Kg loads and 1600mm reach.